The US Navy has sacked two senior commanders from a warship that was involved in a fatal crash with an oil tanker near Singapore. It cited a "loss of confidence" in the pair after the guided-missile destroyer USS John S McCain hit a tanker on 21 August, killing 10 American sailors and injuring five others. The ship suffered damage to its side after colliding with the Liberian-flagged Alnic MC in the early hours, but sailed under its own power and arrived at the Changi naval base in Singapore with a large hole torn in its hull. The Pacific-based US Seventh Fleet confirmed commanding officer Alfredo J Sanchez and executive officer Jessie L Sanchez were "relieved of their duties" on Wednesday. "Both were relieved due to a loss of confidence," it said in a statement. The two commanders have since been reassigned to other duties in Japan. The latest move comes after the US Navy fired the-then commander of the Japan-based Seventh Fleet, Vice Admiral Joseph Aucoin, following the August crash. The incident came after another destroyer, the USS Fitzgerald, collided with a Philippines-flagged cargo ship off Japan in June, which left seven sailors dead. Two other non-fatal incidents have also taken place this year, with the USS Antietam running aground near its base in Japan in January and the USS Lake Champlain colliding with a South Korean fishing vessel in May. Several other officers and sailors have also been relieved of duty or reprimanded following the USS McCain crash. In its statement, the US Seventh Fleet insisted the incident was "preventable". It said: "While the investigation is ongoing, it is evident the collision was preventable, the commanding officer exercised poor judgement, and the executive officer exercised poor leadership of the ship's training programme." Some Navy officials have put the collision down to strains from regular extended deployments, delayed maintenance and budget constraints, including reductions in resources devoted to training. 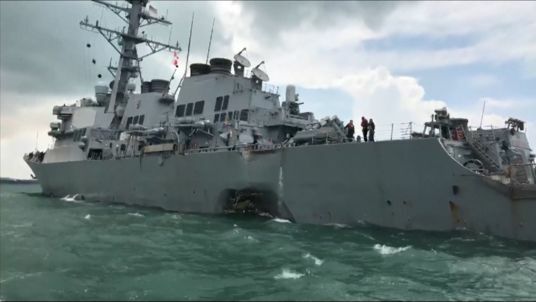 In the aftermath of the collision, the chief of the US Navy, Admiral John Richardson, said there was no indication the collision was intentional but an examination would include a full analysis of the vessel's cybersecurity. He added: "I have directed an operational pause be taken in all of our fleets around the world."